A Virtual Environment is an isolated Python installation designed to avoid filling our base one with libraries we might use for only one project. It also allows us to manage multiple versions of the same package in different projects. We could, for example, need Django 2.2 for one and 1.9 in other. In this series of articles, we'll use Poetry to manage our dependencies, build a simple project and, with a single command, publish it on PyPI. Add our virtual Environment to VSCode. Integrate our dev dependencies with the editor. Build our project with Poetry. Note: For existing projects, you can use the poetry init command and interactively create a pyproject.toml. Note: To be able to publish your project, you need an available name. Use the PyPI search tool for this. description = "A simple decorator to measure a function execution time." First is the Python version. 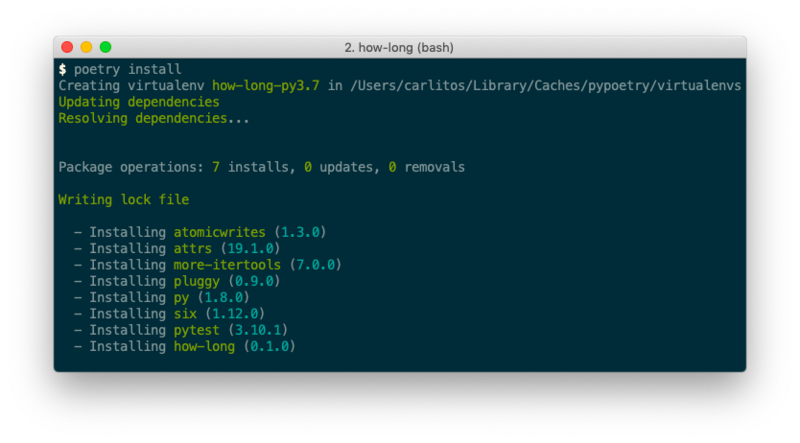 Basically, this project will be compatible with Python 3.7 and up. Also, from now on, every package we install that is meant to be used in production will be listed here. These packages are only for development and will not be included when we publish our project. By default Poetry includes Pytest, so we will use it to test our project later on. After is done, a new file, poetry.lock will be created. When Poetry has finished installing, it writes all of the packages and the exact versions of them that it downloaded to the poetry.lock file, locking the project to those specific versions. You should commit the poetry.lock file to your project repo so that all people working on the project are locked to the same versions of dependencies (more below). 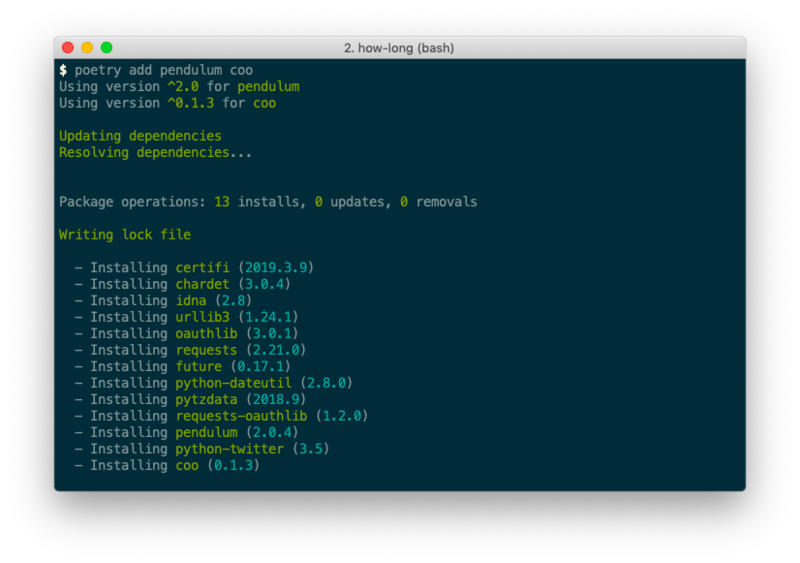 One way to add or remove dependencies is to directly edit pyproject.toml and run poetry install to apply the changes. We instead will use the add and remove commands to avoid manual modifications. Open pyproject.toml and poetry.lock and see how they have updated. These dependencies will be available only during development, Poetry will not include them when building and publishing the project. poetry new [package-name] Start a new Python Project. poetry init Create a pyproject.toml file interactively. poetry install Install the packages inside the pyproject.toml file. poetry add [package-name] Add a package to a Virtual Environment. poetry add -D [package-name] Add a dev package to a Virtual Environment. poetry remove [package-name] Remove a package from a Virtual Environment. poetry remove -D [package-name] Remove a dev package from a Virtual Environment. In the Second Part, we will see more Poetry commands, add our Virtual Environment to VSCode and use the dev packages we installed to lint (Flake8), format (Black) and test (Pytest) our code inside the editor. Finally, in a third one, we will write and publish a sample library to PyPI. Any doubt or suggestion? Please leave a comment. Do you want to Delete Python projects with Poetry and VSCode. Part 1? 2019 Python Cheatsheet by @pyCheatsheet. Fork this website. Fork the Python Cheatsheet.